Break out the needles and cast on to celebrate the annual WWKiP Day! Have fun and enjoy the day! DK will be out and about with a new design dancing along the needles! DK Windowpanes is a textured shawl, triangle shape, knit flat, in one-colour or in a 3-colour combination. Both colour options create a beautiful textured shawl featuring horizontal and vertical contours. The 3-colour combination utilizes colour to further enhance the textured stitches. The pattern is recommended for intermediate level and the instructions are provided in written format as well as chart format …… so one gets to choose which format works best for you! Join the fun and cast on! The DK Windowpanes KAL starts June 1st onRavelry so all you need to do is Sign-up and purchase by June 1, 2017 for $5.00 CDN ($2.50 off the pattern price). After June 1st the price will be finalized at $7.50 CDN. Note: The DK Windowpanes Shawl design is versatile, well suited for a variety of yarn weights, so consider your stash and give consideration to needle size for an appropriate gauge for your chosen yarn weight. If you have questions, please ask. The shawl size/measurements may be customized, by a decrease or increase in the number of repeats; with an appropriate provision for additional yarn requirements when up-sizing. FINISHED MEASUREMENTS (approx.) blocked, in Nurtured by Julie Asselin, 100% fine wool - Rambouillet/Targhee/Merino. At sign up/purchase: the pattern introduction: materials/ yarn requirements, stitch key, chart key and pattern notes. June 28: Part 6 and 7. Come along and enjoy the adventure! I will be knitting along and will be happy to reply to any questions. Adventures, research, exploration and finds were enjoyed in my travels to the southwest of AUS this past month. Coastline views, rural countryside, botanic gardens, architecture, artists, storekeepers and crafters were some favorite moments. Collectively all of the days and experiences contributed to a renewed sense of excitement and encouragement. All of which is bountiful and influential to one's creative process and energy. It is always rewarding and a worthy investment to take moments to feed the soul and enrich oneself. Those moments are gifts and I look forward at the horizon .......... to that which is yet to be! Do come along and join me in unfolding another chapter in designing knitwear. Knitwear designer Bonnie Lefebre, DK Knitwear/DK-DydeeKnits, will be at the LYS Wooly Ewe on Saturday February 4th for the DK Harris workshop with local knitters of the Bulkley Valley. 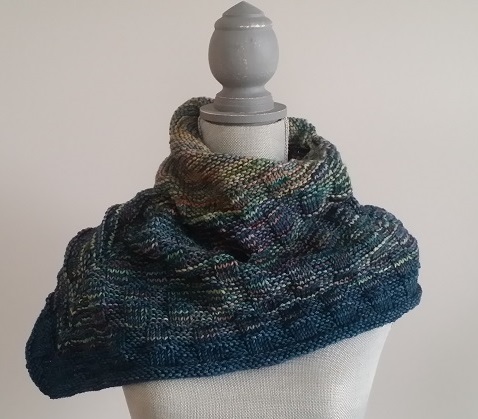 The DK Harris design is a luxurious textured shoulder cowl, featuring colourful tweed and garter stitch patterns, accented with a cable detail. The DK Harris design was inspired by the traditional Harris Tweed knitted stitch and the colourful Clan Tartans of Scotland. Thank you to all the knitters who participated in the DK Bellabean workshop class at the Wooly Ewe yarn store in Telkwa, BC, this past Saturday! Everyone enjoyed learning a couple of new stitches and working the cable cast on. All colour choice combinations in the Zealana Rimu DK, were wonderful and each showcases the texture, versatility and personality that the DK Bellabean design offers. Enjoy the rest of your knit everyone ...... and we all look forward to the project picture posts on Ravelry! 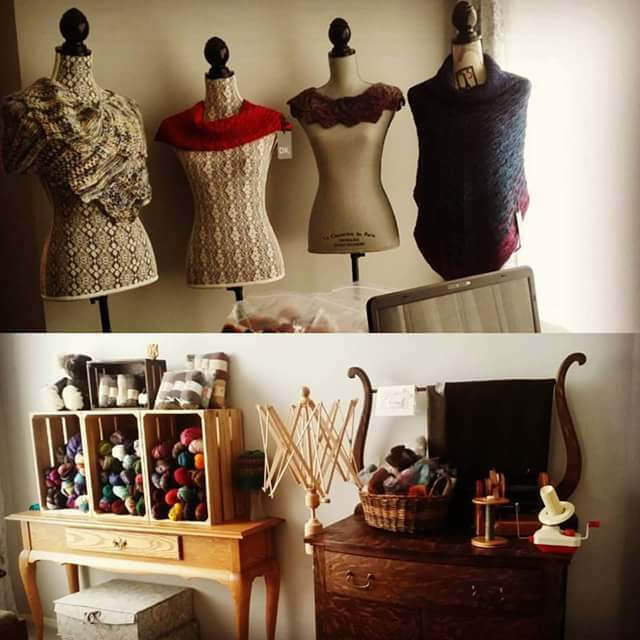 Today I reorganized the DK workspace, dusted off the furniture, freshened up the yarn stash, decluttered the swift and cakin' station and adorned "the ladies" in some DK Knitwear designs! Yeah! It is so rewarding to have bright, natural light beaming in the windows on a such cold winter day, some beautiful fresh colours of yarn on the shelf, and an freshly organized workspace in which to dream, create and design in. Feeling blessed and revitalized. 'Tis the night before Christmas . . . . . .
. . . . .and MeRRy mErrY mErRy wishes to all from Seed and Sprout !